Proxy voting is when someone else is allowed to vote on behalf of a voter. Essentially, the voter gives their voting rights to another individual. This person may be another voter, or it can be someone involved in administration — for example, it is common for a Chairperson at an Annual General Meeting to be eligible to be a proxy for any voters who want to invoke a proxy. Not all organizations are permitted to offer the ability to invoke a proxy to their voters, so it is recommended that you check your organization's bylaws/constitution to ensure that proxy voting is authorized for your voters before proceeding. Depending on your proxy voting process, there are several ways to utilize the ballot to manage proxy voting. 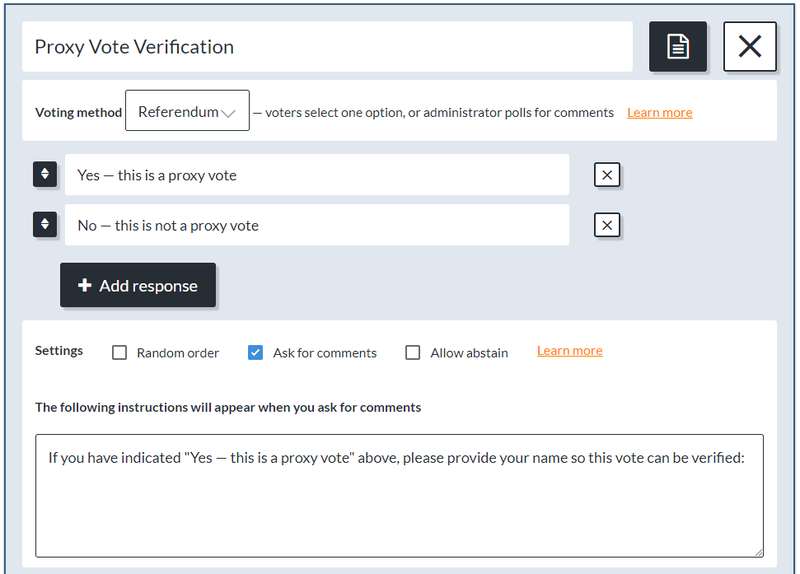 If your organization traditionally uses a paper-based form for their proxy voting process, you can use an Electionbuddy ballot to automate the process of distributing the form. 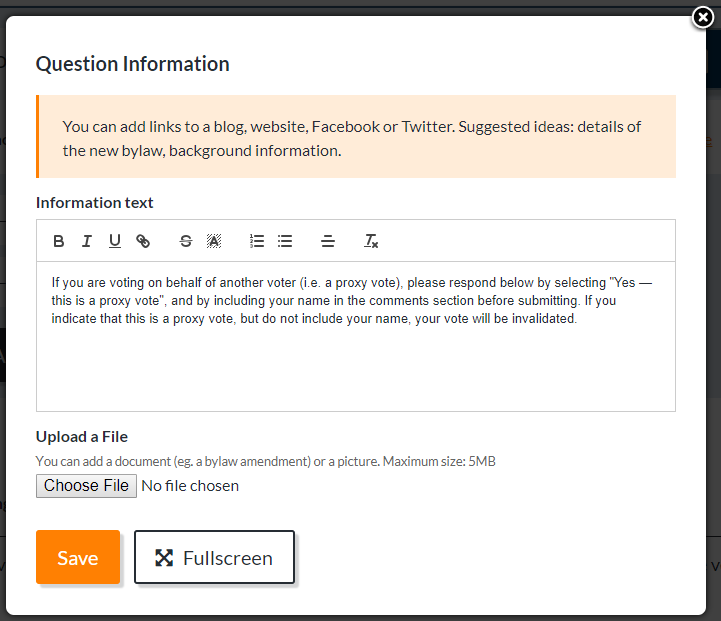 Design and prepare your ballot question(s) as required for your election. Voters can download, print, and complete this form manually. They can then drop this off at your organization's main office, or scan it and email it back to you. Alternatively, if the voters have a PDF editor, they could fill it out electronically and email it back to your organization. Proxy voting can also be managed in a different process by utilizing email forwarding. This diminishes the need for paper forms. Set up your ballot as required. Proceed to the "Notices" page of your election setup, and choose "Email Notices". This will cause new default text to appear in your email notice template that encourages the forwarding of the email notice to a proxy if the voter would rather have a proxy than vote for themselves.